Born in 1955 in Seattle, Washington, Bill Gates by no means struggled as a child. In fact, he had quite the stable upper-middle-class upbringing, with a renowned lawyer for a father, William H. Gates, Sr. It was originally intended by Gates’ parents that he follow in his father’s footsteps and become a lawyer. At the early age of 17-years old, Gates had demonstrated the entrepreneurial spirit, forming a company with his childhood friend, Paul Allen, called Traf-O-Data, in an effort to analyze and process raw traffic data from traffic counters and present that data in a reporting format to traffic engineers. Their goal was to build a hardware device that could read traffic data tapes and produce the results without having to do the work manually. In 1973, Gates enrolled in Harvard University after scoring a near-perfect SAT score of 1590 out of 1600. 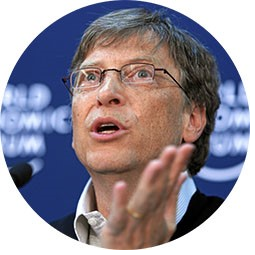 However, it was the following year that Gates dropped out of Harvard to start Microsoft with partner, Paul Allen. The decision, while contentious at the time, was okayed by his parents after much discussion. Obviously, it was the right move.